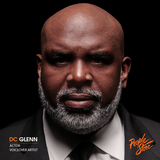 DC Glenn is an American film actor and voice-over artist residing in Atlanta, GA. He is also known as one half of the 90’s rap group Tag Team who created the classic stadium anthem “Whoomp! There It Is." DC has been training tenaciously for film, tv, and commercial acting since 2017. Enjoying this fruitful journey with such acting houses as Atlanta Acting Arts, Marsten Studios, Robert Pralgo Acting and Get Scene Studios in Georgia. DC is relishing the process of auditioning and training to become a working actor. With the aid of The People Store agency in Atlanta, GA. as his representation. DC is on the positive path to evolve his craftsmanship in the art of acting.